Building an employer brand takes time. Showcasing your company values and culture in its true form will allow you to attract talent to your roles. Enabling you to build a reputation as a great company to work for. After investing time and budget, you want to get the best out of the finished product. Having an employer brand isn’t where it should end, it isn’t something that should just exist to tick a box. You want it to add value to your recruitment strategy and to be able to present an ROI so taking it, and promoting it should be your next move. Jobseekers are compared to consumers. They shop for companies they want to be a part of. So like consumers, you are required to attract them by promoting and marketing your brand. By doing so you are creating trust with the ‘consumers’ and building relationships. This results in them being able to see themselves as a ‘fit’ for your company and convinces them to apply for your roles. There are various different channels that you should think of using as part of your employer branding strategy to help you promote your employer brand throughout the various touch points of the candidate’s journey. According to research, 62% of job seekers use social media to assess a companies employer brand. By sharing your employer brand across your own companies social media pages it will present an opportunity to attract new candidates to your roles. Another advantage is the fact that you can also reach passive candidates – those who aren’t currently looking for a job, but with great content, you could sway them to take up a great job offer. It is a simple, fast and affordable way to help assist your employer brand and help spread the word. 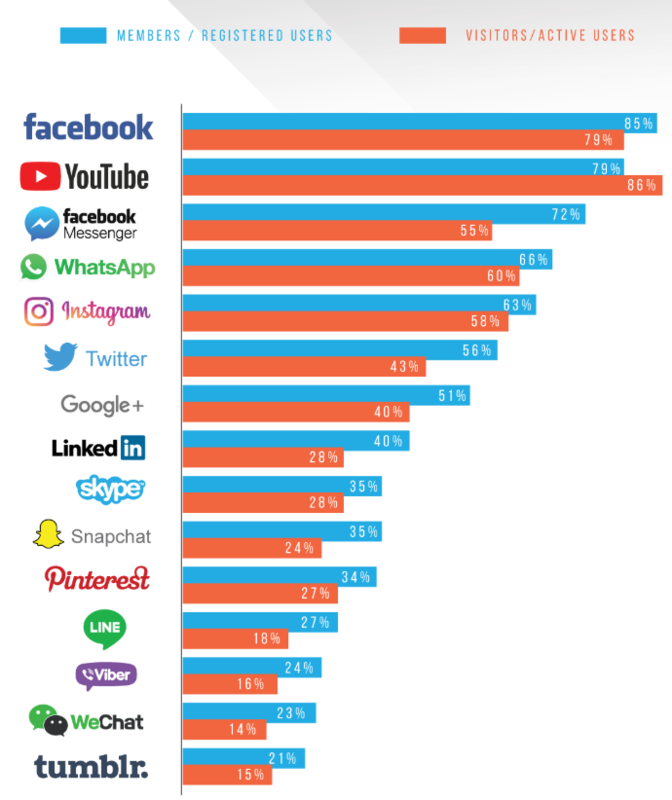 Below is a chart of the most popular social media channels where users are active. Your career site is the heart of your recruitment so a careers page is something that you should add to your companies website. Social media is a great way to attract talent but where do you want them to end up when they click on your job opportunities. Integrating your hiring platform to your careers page is also easily done. By doing this you are creating a portal of trust and also a way to centralize your whole recruitment process. Make sure to fill your career site with rich media including photos, videos of the workplace, staff nights out and anything else that you think would help a candidate in deciding if your workplace is the right fit with them. Really sell your brand! Who better to promote your employer brand than your employees. Jobseekers have a tendency to trust regular employees rather than company executives, so put your employees at the forefront of your recruitment and let them be part of your companies voice. Empowering your employees is a great way to create a connection with potential candidates and it allows you to gather great content for your employer brand. Creating a day in the life of … videos. Ask your employees to share your companies content or job opportunities across their own networks to expand your reach. Don’t forget to reward them for their contributions!